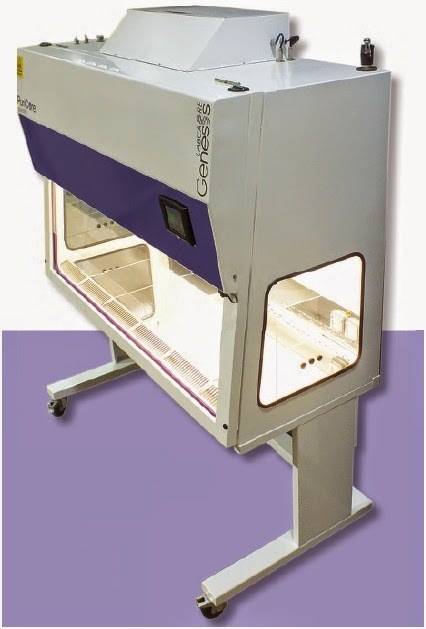 The labcaire Genesis Class II Microbiological Safety Cabinets will revolutionise the Class II market, offering customers a new innovative product with truly unique features. Low energy consumption, ultra low noise fans, combined with an ergonomically and aesthetically modern design, ensures enhanced operator comfort during prolonged usage. The unique inflatable gas tight pressure seal effects a new level of simplicity in door sealing, ensuring no crevices of channels around the electronically operated glass sash. The full colour screen display enables clear user interface, and display of parameters, plus increased functionally and control never before seen in Class II Cabinets. 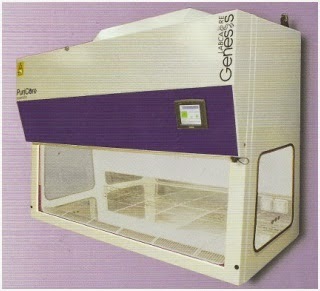 Avaible in four sizes (900mm, 1200mm, 1500m & 1800mm wide) the Labcaire Genesis is suitable for all Laboratory applications. Your Choice (Ducted, Recirculating or VAV / Thimble By-Pass) When used in conjunction with the anti-blow back valve, the unit can easily be connected to exhaust ductwork or a VAV / Thimble By-Pass extract system to exhaust air externally. 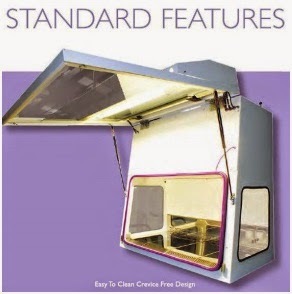 The unit is also designed to cater for low cailing rooms (2300mm ceiling heiht); at only 2298mm including a base stand (830mm) and allowing for 100mm clearance for exhaust airflow. Providing environmentally friendly ultra low powder usage of 0.5Kw (2Amps), combined with quiet operation EC / DC 24 volt fans with less than 55dB(A) noise level. The ergonomically and aesthetically modern design ensures enhanced operator comfort during prolonged usage. The full colour 5½” touch screen control panel offers digital monitoring of booth the air flow into the cabinet and the laminar air flow within the unit. Alerting the operator to any safety or maintenance requirements via both audible and visual alarms. The touch screen also controls the operation of all ancillary features such as Electrical Sockets, Gas & UV Lighting. 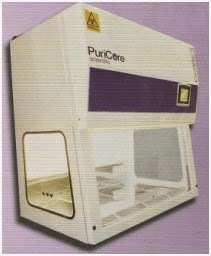 In addition the Labcaire Genesis Cabinet is pre-configures for use with VHP (Vaporised Hydrogen Peroxide) and Formaldehyde fumigation, for total flexibility, as standard.